A long time ago (1998) researchers in a galaxy far, far away (Brazil) discovered a sucker-mouthed catfish that looks like Greedo, the bounty hunter who tries to extort Han Solo in the Mos Eisley Cantina. 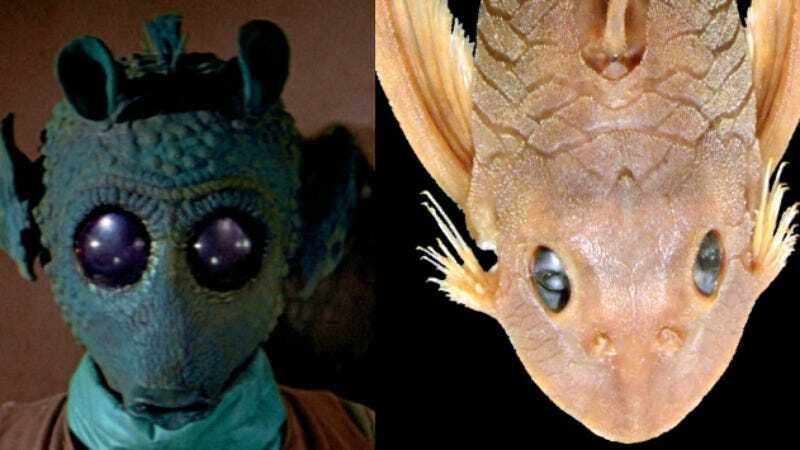 Seventeen years later, Auburn University researchers/Star Wars fans finally got around to naming the fish Greedo peckoltia; the fish’s blue eyes, big puckering mouth, and protruding bristles make him look like a distant ancestor (or sad descendant?) of the ineffective bounty hunter who had been so looking forward to seeing Han finally getting his. Jonathan Armbruster, whose job title includes “curator of fishes” along with professor of biological sciences, got his hands on the Greedo catfish specimen in 2005 for a manuscript on the genus of small South American armored sucker-mouth catfishes, according to the university. But it wasn’t until recently that he, along with along with biologists David Werneke, Milton Tan, and Chris Hamilton, returned to examine the specimen. Peckoltia greedoi joins the ranks of Otocinclus batmani (the fish Gotham City deserves), Spongiforma squarepantsii (actually a fungus that looks like SpongeBob), and Gollum suluensis (a shark from Middle-Earth, a.k.a. New Zealand). A side-by-side comparison is below.